These uplifting words come from Mystical Mountain, the opening song of Phillip the Egg, the mystifyingly titled third release by Magic Bus. They sum up the positive and joyful atmosphere of the album as this talented band take us on another musical Astral journey. With a band name derived from Tom Wolfe’s book The Electric Kool-Aid Test, about Ken Kesey’s counter culture ‘Merry Pranksters’ who travelled ’60s America in a psychedelically painted bus called ‘Further’, also known as ‘The Magic Bus’, it is inevitable that this is a band that unashamedly basks on the sunlit hills of the hippy idyll with musical and lyrical inspirations drawn from that era. 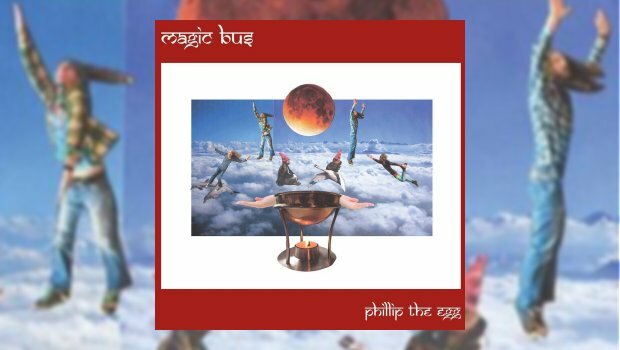 Phillip the Egg gloriously continues along that path, but this time Magic Bus take it on to greater heights with a more expansive and vibrant approach. Mystical Mountain typifies this development as it commences in a vein reminiscent of their previous Caravan/‘Canterbury’ inspired 2014 album, the fine Transmissions from Sogmore’s Garden, tripping along whimsically with mellifluous guitars, lovely harmony vocals and short flute swoops. However, just when you think it’s over it then takes off in a whole new direction with an extended instrumental second part. A simple guitar riff is built on by bass, drums and a soft flute as it rises in tempo and volume, perhaps akin to ascending a mountain, before we reach a simple piano plateau which leads to a further rising simple guitar, bass and subtle drum passage – and then Magic Bus really start to raise the musical power. Jay Darlington’s sinuous work on the organ and Terence Waldstadt’s scintillating guitar play off each other as the band dramatically reaches the peak of the Mystical Mountain – Viv Goodwin-Darke’s flute floating off into the distance like a bird released. For an opening song it certainly sets out Magic Bus’s more ambitious stall and indicates that this is an album which reveals their more progressive rock influences, conveying more of the energy and power of their impressive live sets. Once again Magic Bus take the songs to another level, perhaps beyond where they may have left it on previous albums. Hypnotic organ chords induce a mystical sense of ritual joined by the band rising in power as the guitar intertwines with Darlington’s exciting organ runs and Spring’s powerful but restrained drums. We return to the soft idyll of the introduction in the coda, and you have a sense of having followed a relatively short but beguiling musical trip into another time and place. The pace and sense of travel is taken to another level on Zeta, a rippling and entrancing space chant imbued with Eastern rhythms. This is an exciting piece infused with short but sweet organ, flute and guitar solos that do not distract but combine skilfully to take the ride further towards the chanted Astral Portal. 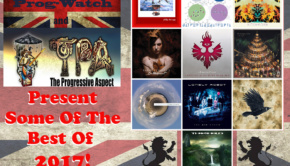 There are definite echoes of Ozric Tentacles or Gong in this piece, and Evans and Darlington have said that Gong have always been one of their influences, and that this has come much more to the fore on this latest album. Magic Bus are a band which loves its science fiction and sense of mysticism. 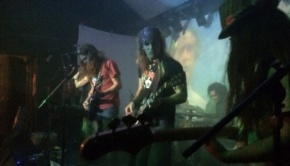 Paul Evans and Jay Darlington readily admit to a fascination with the Sci-Fi of the ’70s, and this interest permeates their songs in sound and theme, particularly the more angular Distant Future, driven along with a great bass line by Wihll Mellorz, underlining his deft touch throughout the album. Walstadt throws in a great and characteristically distorted guitar solo to enhance the futuristic feel, followed by Goodwin-Darke’s spiralling flute stabs, all backed by Darlington’s keyboard sounds and effects. Kepler 22b powerfully continues the cosmic themes of much of the album, based on a planet that appears to be similar to Earth and possibly habitable in a ‘Goldilocks’ orbit (i.e. not too hot and not too cold) around a star in the Cygnus constellation, 600 Light Years away. This is an exhilarating instrumental full of diverse sounds, themes and excellent musicianship, building on the feel and epic sweep of the excellent Jupiter 3 AM from Transmissions from Sogmore’s Garden. Jupiter 3 AM is always a highlight of their live sets, and there is a very real sense that this new album is a much more evocative representation of the energy and power of their stage performances, Kepler 22b’s fascinating musical orbit will undoubtedly be an exciting addition to their atmospheric gigs. After such a breathtaking ride it is perhaps appropriate for Magic Bus to lead us to calmer musical waters in the delightfully wistful Kalamazoo. 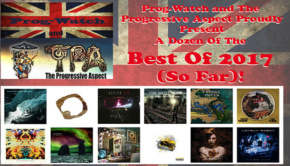 This diaphanous song was somewhat unusually written mainly by drummer Connor Spring and bassist Wihll Mellorz, whom apparently were just playing about in the garden of the recording studio with two 12-string guitars (how much more ‘Prog’ can you get!) when Evans and Darlington liked what they heard and Evans helped them hone it into a lovely piece to soothe the soul. 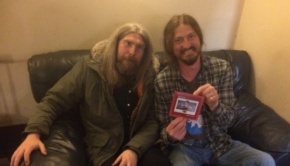 Evans and Darlington have shared how important and inspirational the environment and atmosphere of Vale Studios in Worcestershire was in the creative process of making this album, and this beautiful lilting song is testament to that observation. The final song Yantra Tunnels announces itself with shimmering Eastern sounds, befitting the Yantra’s association with the mystical diagrams of Tantric traditions. Wihll Mellorz lays down a subtle bass under a sinuous synthesiser line intertwined with flute. Another multi-layered and fascinating trip unfolds as the band spirals upwards in Gong-like raptures, and then they take off in a powerful and scintillating instrumental finale… which then fades into the distance. Possibly curtailed to enable a vinyl length release, it is very likely that unleashed in a full live manifestation Yantra Tunnels will develop even more cosmically and expansively, typifying the real sense of the power and energy of live performance being channelled in this impressive album. Join the Magic Bus on their mystical musical journey, and free yourself with them on their road.